1 The guidance given herein should by no means rule out the principles of good seamanship, neither can they replace experience in stowage and securing practice. 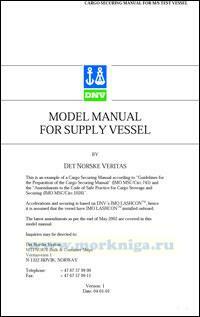 2 The information and requirements set forth in this Manual are consistent with the requirements of the vessel's trim and stability booklet, International Load Line Certificate (1966), the hull strength loading manual (if provided) and with the requirements of the International Maritime Dangerous Goods (IMDG) Code (if applicable). 3 This Cargo Securing Manual specifies arrangements and cargo securing devices provided on board the ship for the correct application to and the securing of cargo units, containers, vehicles and other entities, based on transverse, longitudinal and vertical forces which may arise during adverse weather and sea conditions. 4 It is imperative to the safety of the ship and the protection of the cargo and personnel that the securing of the cargo is carried out properly and that only appropriate securing points or fittings should be used for cargo securing. 5 The cargo securing devices mentioned in this manual should be applied so as to be suitable and adapted to the quantity, type of packaging, and physical properties of the cargo to be carried. When new or alternative types of cargo securing devices are introduced, the Cargo Securing Manual should be revised accordingly. Alternative cargo securing devices introduced should not have less strength than the equipment which it replaces. 6 There should be a sufficient quantity of reserve cargo securing devices on board the ship. ANNEX 5 Safe stowage and securing of heavy cargo items such as locomotives, transformers, etc.